Welcome to the one hundred and forty-first of my blog interviews with novelists, poets, directors, bloggers, autobiographers and more. Today’s is with article writer turned mystery novelist Anne White. A list of interviewees (blogged and scheduled) can be found here. If you like what you read, please do go and investigate the authors further. Morgen: Hello Anne. Lovely to ‘meet’ you again after your spotlight earlier this month. Please tell us something about yourself and how you came to be a writer. Anne: I always loved books and reading. I majored in English in college and spent many happy hours in public and college libraries and book stores. My first job after college was as correspondent for an area newspaper. Although I tried to uncover interesting news, I sometimes fell back on writing pieces like “Mr. and Mrs. John Smith called on Mr. and Mrs. George Jones last Sunday.” I married, had six children and lucked into my perfect job as high school librarian and yearbook adviser for the rapidly growing Queensbury School District in upstate New York. Morgen: Sweetening ‘normal’ stories is definitely an art; great for creative writing I’d say. What genre do you generally write and have you considered other genres? Anne: For ten of my years at Queensbury, I worked as a career counsellor (two years full time, eight years along with my regular position as high school librarian). The two jobs meshed well. I found I also enjoyed writing articles on careers and, during that time, I had more than 100 articles on career topics accepted by three magazines for high school students. When I retired after 32 years and was forced to leave the books and students behind, I turned to mystery writing. Morgen: “forced”, that’s sad but 100 articles, wow. Apart from those, what have you had published to-date? If applicable, can you remember where you saw your first books on the shelves? Anne: I’d like to start with the second half of the question, since nothing will ever top the experiences I had with the publication of An Affinity For Murder, the first book in my Lake George Mystery Series. In the late ’90’s I took a writing workshop from Saratoga Springs NY writer, Matt Witten, author of Breakfast at Madeline’s and other books in his Jakob Burns Mystery Series. An outstanding teacher, Matt urged me to submit the first 50 pages of An Affinity For Murder to the Malice Domestic organization which offered an Unpublished Writers’ Grant to aspiring mystery writers, a grant Matt himself had won a few years earlier. Long story short: To my amazement, I won the grant. An agent called and asked to represent me. I didn’t realize how unbelievable that was and put him off until his third phone call before I agreed. He tried to place the book with New York publishers, but had no luck. At this point, Matt had moved his young family to California and wrote for TV shows like Law and Order and Poltergeist. When he heard about the Dark Oak contest offered by Oak Tree Press, he urged me to apply. Again, to my surprise, I won publication of my mystery, along with Wendy Howell Mills, the talented young author of Callie and the Dealer and a Dog Named Jake. I’ve posted about this on the OTPBlog, August 1, 2011 (To find it, click on the latest post listed and scroll back). Morgen: Let’s hope it won’t be a surprise for ever. 🙂 Oak Tree Press are great – I’ve had a few of their authors come ‘through my doors’ and they’re always saying such good things about OTP. Anne: I urge anyone not yet published to check out the Malice Domestic grant on their website and to watch for their recap of 25 years of Malice Grant winners this fall. Since that time, I’ve written four more Lake George Mysteries. In addition to An Affinity For Murder, c’01, ISBN 1892343-16-9, they are Beneath The Surface, c’05, ISBN 1-59133-124-2; Best Laid Plans, c’06, ISBN 1-59133-170-6 and 978-159133-170-4; Secrets Dark and Deep, c’07, ISBN 1-59133-198-6; and Cold Winter Nights, c’09, ISBN 1-59133-298-2, 978-1-59133-298-5, these last four published by Hilliard and Harris. Morgen: Shameless plug (the ISBN numbers) but I like it. If you can’t be shameless here where can you be? 🙂 I’m guessing the answer is going to be a lot as you’re clearly good at it, but how much of the marketing do you do for your published works or indeed for yourself as a ‘brand’? Anne: I’ve been trying to step it up by doing interviews with Fran Stewart on Murder She Writes, Sylvia Dickey Smith and a radio interview with Megan Willingham at AdviceRadio.com. Also I’ve posted on Leila Taylor’s Creatures ’n Crooks Bookshoppe, Chris Redding’s AuthorsDay, on Donna Lee Simpson’s http://cozymurdermysteries.blogspot.com, Dames of Dialogue, with KD Easley, and with Christy Tillery French, Buried Under Books and Poe’s Deadly Daughters. Also at Huletts Current and area newspapers, The Post Star, The Chronicle, Lake George Mirror, Adirondack Guest Informer and http://theFreegeorge.com. Morgen: Wow, that’s some going… and then I bombard you with all these questions. 🙂 But you’re a professional so I’m going to keep going… you’ve done well with competitions (any more? ), do you think they help with a writer’s success? Anne: I mentioned winning the Malice Domestic Unpublished Writers’ Grant and the Dark Oak Contest – terrific confidence boosters – and yes, I did think they helped. Then in 2002, An Affinity For Murder (unchanged) was one of 5 books nominated for the Malice Domestic Best First Mystery Award. This made for an amazing night at the Malice Domestic Conference in Washington, a super experience which led to some great PR. Morgen: But you still have to keep going with it yourself by the sound of it. Do you write under a pseudonym? If so why and do you think it makes a difference? Anne: No, but I often wish I had a more elegant name than Anne White. Morgen: But easy to spell. 🙂 You could always write another genre under a different name… so your readers don’t get confused. Delores Finklepickett perhaps? 🙂 (not sure where that came from) Do you have an agent? Do you think they’re vital to an author’s success? Anne: I don’t have one now. I’ve had two agents. I heard the first one made so much money (although not from selling my book) he retired very young. The second one and I parted ways. I’ll try for another when I finish the first book in my new series which is set in a book store in my hometown. Morgen: Ooh great. I’ve set mine around here because few authors have and it’s easy research (that’s one of my answers to ‘least favourite’ which we’ll come to later). We’ve not talked about eBooks yet, are your books available as eBooks? If so what was your experience of that process? And do you read eBooks? Anne: All five of my Lake George Mysteries are on Amazon, both in print and on Kindle and, I think, on Nook. I love the idea that I can read them on my Kindle. My goal now is to get them accepted for audio books, since listening to books on tape meant the world to my mother as her sight failed. Also, I love to listen to audio books myself on long trips except I was once so caught up in one written by a favorite author, I missed my thruway exit. Morgen: Oh so do I because I can listen and be doing something at the same time (walking the dog / to or from work usually). What was your first acceptance and is being accepted still a thrill? Anne: I hadn’t seen a copy of An Affinity For Murder, the Dark Oak winner from Oak Tree Press, until I got to the Malice Domestic Conference in Washington in May 2001. Co-winner Wendy Howell Mills and I met in the hotel lobby, opened the boxes of Oak Tree publisher Billie Johnson had sent to the hotel for us and signed copies for one another. Nothing can ever top that, but it’s still a thrill when anything – book, article, blog, or post even — is accepted and appears in print. Morgen: Isn’t it great… I think that’s what most of us are here for. So, all this success, has there been a downside? Have you had any rejections? If so, how do you deal with them? Anne: Of course – many rejections. I’m always disappointed, then try to figure out why. Morgen: You figure it’s just not for them and move on… What are you working on at the moment / next? Anne: I’m starting a new series, set in a town very like where I live, but with names changed to protect the innocent. Morgen: I like that. Ooh, or maybe not so innocent. Anne: I’ve set it in a book store with an eerie lower level (think Seattle or Montreal undergrounds or maybe you have similar kinds of sub-basements in buildings in England). I may need to find a more unusual setting than a book store, but I hate to give up on it too soon. Anne: Working title is Starting Over, as my character has left a job with a New York City publisher and sunk her limited funds into a shabby, poorly stocked book store. And you guessed it – the disagreeable guy she bought it from turns up dead in the basement. I’ll welcome suggestions for unexpected plot twists and a more creative title. Morgen: Sue Moorcroft (local author / blog & podcast interviewee / friend – not necessarily in that order) released a book of that title and she’s Choc Lit’s top-selling author. 🙂 But mmm, maybe something more bookishly dramatic. Readers: suggestions please… and plots, maybe he could be her long lost father / uncle… mmm, maybe not. 🙂 Do you manage to write every day? What’s the most you’ve written in a day? Anne: Usually. As I near the end of a book, I often keep at it most of the day and into the evening. Some days though are a lost cause. Morgen: Life takes over. 😦 What is your opinion of writer’s block? Do you ever suffer from it? If so, how do you ‘cure’ it? Anne: I do suffer from it occasionally. Sometimes rereading what I’ve already got down, helps propel me forward. Morgen: Or with a break in between? Do you plot your stories or do you just get an idea and run with it? Anne: A little of both. Morgen: You’ve mentioned a couple of characters there, do you have a method for creating your characters, their names and what do you think makes them believable? Anne: Hit or miss really. I sometimes give a character a quality someone I know exhibits, but not in a way which will make the person suspect I’ve done it. Morgen: I’ve just recently bought some bits and pieces from The Literary Gift Company including a great t-shirt which your comment just reminded me of. Sorry, yes, characters’ names. Anne: I’m not creative with names and have to fight against calling someone Tom Smith, as I did in an earlier answer here, although look how well Tom Jones has worked as a name. Morgen: I want to call everyone Elliot (which fortunately can be used as a first or surname) but usually manage to restrain myself. Who is your first reader – who do you first show your work to? Anne: I’ve belonged to some great writers groups in nearby Saratoga Springs and at the Lake George Arts Project in Lake George Village. I also belong to Mystery Writers of America and three Sisters in Crime groups, but right now, I’m going to have to find a first reader or count on my publisher for suggestions. Morgen: Some great organisations there but I do find with a group that you want to get more edited than time allows (for me anyway) so have a great editor Rachel (I can give you her email address :)). While we’re on the subject of editors, do you do a lot of editing or do you find that as time goes on your writing is more fully-formed? Anne: I do a lot of editing and rewriting, since I sometimes worry my early drafts are getting worse instead of better. Morgen: Oh dear… again maybe a time gap would be handy… or another competition win to boost the confidence. 🙂 What is your creative process like? What happens before sitting down to write? Anne: I try to think about the story as I’m falling asleep, hoping to wake up with fresh ideas. Sometimes this works and sometimes it doesn’t. Morgen: Well that’s OK – “sometimes it works” is good. Do you write on paper or do you prefer a computer? Anne: Never second, but I once wrote almost an entire book in first person, then used find / change on the computer to make it third person. It didn’t need much cleanup, and I thought it read better in third. Morgen: It often can. Do try second, it’s great. 🙂 OK, I’m going to shamelessly plug now (there are some second person starts on my https://morgenbailey.wordpress.com/sentence-starts page). Do you use prologues / epilogues? What do you think of the use of them? Anne: I don’t use them, but don’t mind when others do. I did include something I called an Author’s Note in An Affinity For Murder in which long-lost Georgia O’Keeffe paintings turn up in a Lake George attic near the cottage where O’Keeffe spent 15 summers. When my protagonist Ellen Davies discovers them, she recalls how 28 O’Keeffe watercolours, called Canyon Suite, were found in a town in Texas where O’Keeffe once lived and were valued in the millions. When they were declared “misattributed” in 1999 shortly after I finished Affinity, I added the Author’s Note. Morgen: I love those character names, easy to remember and very distinguishable between each other. Do you have pieces of work that you think will never see light of day? Anne: Of course. And rightly so, I suspect. Morgen: But maybe you could go back to them at some stage and see if you could just… maybe… or maybe not… 🙂 What’s your favourite / least favourite aspect of your writing life? Anne: I love reaching the point where a book or article begins to come together, takes on a life of its own and practically finishes itself. I hate waiting for that to happen. Morgen: A bit like learning a language and the basis finally sinking in. If anything, what has been your biggest surprise about writing? Anne: I was amazed when Affinity won the Malice Domestic grant and two years later, received the nomination as a Malice Best First Mystery. Both brought recognition beyond my wildest hopes. Anne: Don’t talk about what you’re writing or want to write. Get something down on paper and keep adding to it. Morgen: Absolutely, backside in chair. What do you like to read? Anne: My daughter, Kate White, has a new novel, The Sixes, just out, and it’s terrific. Kate, in addition to being editor of Cosmopolitan Magazine, writes mysteries and career advice books and has shelves full of her own books in many languages. And she’s a great daughter besides. Google her at Kate White. Anne: I also recommend Vermont writer Nancy Means Wright, Marilyn Rothstein from nearby Saratoga Springs, who writes as M.E. Kemp , and Rosemary Miner who sets her Once Upon A Time mystery series in a 19th century Adirondack town. Morgen: Ooh would Kate like to do an interview? Or perhaps an author spotlight?… or guest blog… 🙂 What do you do when you’re not writing Anne? Anne: When I’m not writing, I read and think about writing. Former librarian. Morgen: 🙂 I’m not a librarian former or otherwise but I live and breathe writing too (can you tell?). Are there any writing-related websites and / or books that you find useful and would recommend? Anne: Oak Tree Press has some great posts on http://otpblog.com. Murder Must Advertise provides a lot of useful information from other writers and the Hilliard and Harris site is adding posts and articles. Morgen: I’m going to have to add these to my ‘links’ page. 🙂 In which country are you based and do you find this a help or hindrance with letting people know about your work? Anne: I live in Queensbury in upstate New York in the United States. Both my publishers, Oak Tree Press and Hilliard and Harris, are located in the United States and I’d love to have my books published in other countries. Worldwide, a division of Harlequin in Toronto, Canada, has also published my five Lake George Mysteries as part of their Worldwide Mystery selections. Morgen: Well, with eBooks you technically are internationally published. 🙂 Are you on any forums or networking sites? If so, how invaluable do you find them? Anne: Facebook and MySpace. Murder Must Advertise is a great site for getting to know United States, as well as some Canadian, writers. I’m trying to make better use of these. Anne: My website is http://www.annewhitemysteries.com. I’ve included background information and some of the articles I’ve written for Mystery Scene, Mystery Readers Journal, and other publications. Morgen: Ooh great. 🙂 What do you think the future holds for a writer? Anne: Wow. Things have been changing so fast here, and I assume in England too, I wouldn’t dare predict. Morgen: Yep, I’d say so. In the right direction though I think. Is there anything else you’d like to mention? Anne: I’ve run on enough. But if you have questions, I’ll be happy to answer them. Anne: What made you start this site? Aren’t you overwhelmed with responses? 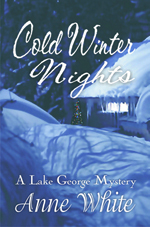 I then invited Anne to include an extract of her writing and this is from Cold Winter Nights, Lake George Mystery #5, (Hilliard and Harris, c2009). Background: Loren Graham, mayor of the sleepy Lake George town of Emerald Point, has helped plan a Mardi Gras-type winter carnival on the frozen lake. Loren joins a large group of adults and teens, dressed in costumes and masks, for the evening skate. Suddenly, a fierce storm hits and, as skaters hurry to leave the ice, a mysterious figure charges at Loren. “The dark figure raced toward me again, forcing me back to the edge of the rink. Except now there was no edge to the rink. The committee had taken down the poles and ropes. The ice was open. I was forced back, closer to the large dock where the bubblers kept the water churning. Suddenly, the lights along the shore went out. They disappeared all at once as if snuffed out by an unseen hand. The sound of the bubblers, powered by electricity, stopped. Darkness, thick and silent, blanketed the lake. Anne White, a former high school library media specialist, is the award winning author of five Lake George Mysteries, a member of Mystery Writers of America, the National, New York and New England Sisters in Crime, the Lake George Arts Project and the New York State Retired Teachers Association. She lives in Queensbury in upstate New York and is the mother of six children and grandmother of twelve. Morgen, Thrilled to find this post a few minutes ago. I’ve had serious e-mail problems since Saturday when I lost internet access. Luckily, the 5th computer guy to try to solve the problem, has me up and running. You do a great job with interviews and I’m pleased to be included on your site. Thank you again for featuring me. Anne was a Dark Oak winner before I started working for Oak Tree Press, but I have to say that she has taken a route I encourage others to try. I love writing contests and was known as The Contest Queen when writing short stories. So many people are leery of being ripped off by contests that they never throw their hat in the ring. Anne is proof that contests can actually propel your career to new heights. And Morgen, I have a few pieces of flash I would love to give you! I posted recently about winning Oak Tree’s Dark Oak Contest in ’99 and going back to that time brought so many happy memories. I encourage everyone to check out the Dark Oak contest on your site. I’m so mpressed with all that’s going on at Oak Tree now. You and Billie and Jeana are doing a great job. Frankly, I’m left with the desire to buy a few more books. Living in NY and having visited those locations, I can very well imagine the likes of mysteries in that area filled with those beautiful trees and lakes. Thanks for a very attracting interview. Ah thank you Theresa, I’m sure Anne will be delighted to hear that. Dear Theresavarela, (what a great name) Thanks for your comment. Yes, it is beautiful here — we’re very fortunate. And since Lake George is often called one of the most beautiful lakes in the world, I sometimes feel guilty about imagining murders on its shores. So much so I moved a couple off site. Excellent interview, Morgen. You have a knack for bringing the background to the surface. I enjoy the “insider’s view” of the writer and their work. Anne, congratulations on your success. The Lake George series sounds terrific. Great to hear from you again. Wish we could meet sometime. You’re right about wanting the world to know that all of New York isn’t the city, even though I love to visit there. Slower pace here. As an avid reader, I can’t pass up books (mysteries) about bookstores. Can’t wait to see this series. This is such a great interview. Truly enjoyed it. I may have given a false impression. Protagonists in the Lake George Mysteries are a writer (Affinity) and the mayor of a lakeside town (the next four). It’s the one I’m working now on that’s set in a bookstore. Your comment will send me back to the computer to get some more chapters under my belt and fast. Thanks for the push and the kind words. A lovely, comprehensive interview, Anne. And I love the simplicity of your name. Although I admit that I added a middle name to mine, which is equally simple–mainly because I know several other Nancy Wrights. Anyway, you should be proud of all you’ve accomplished to date. I love the wonderfully written Lake George series, but can’t wait for the new one set in a bookstore. I’ll feel right at home with that! And oh, I was surprised to find my name in here. Thanks! Thanks again. You are always so generous in your comments. Looking forward to our appearance and discussion at The Chronicle Book Fair in Glens Falls, NY on Sunday, Nov. 6. Always a great day with more than 100 authors giving talks, presentations and offering their books for sale. Marilyn Rothstein (writing as M.E. Kemp) will join us for a panel discussion on Bl;ogs, EBooks, Events and Website. An interesting interview. It’s encouraging to hear the experiences of someone who has won contests. I recently read and reviewed The Sixes. Didn’t know Kate was your daughter. Have to check out your books, Anne. Thanks for responding and the kind words. Kate is not only a super daughter, she’s written some great mysteries and career advice books. The Sixes is the latest, but now it looks as if she has another book coming soon. Actually, I’ve read “Callie and the Dealer and a Dog Named Jake” written by Wendy Howell Mills and published by Oak Tree Press, which Anne mentioned in this post. I enjoyed the story and loved her descriptions throughout the book of the Outer Banks setting. I didn’t realize that Anne White was a co-winner in the same OTP contest. I am definitely going to have to read her Lake George mysteries. Oh, and by the way, being a librarian must be like being a kid in a candy store! Your last comment first — Yes, being a librarian is exactly like being a kid in a candy store. There’s nothing like opening those boxes of books you’ve ordered, seeing them for the first time and checking them in. Plus you get to share books with young people who you know will like them and have them come back to ask for others. I was an English major who lucked into the job, then went for the Masters in Library Science. A real stroke of good fortune. The Dark Oak Award — Co-winner Wendy Howell Mills and I met in the lobby of the hotel where the 2001 Malice Conference took place and opened boxes of our books sent by Oak Tree Press editor Billie Johnson. We’d seen proofs, of course, but that was the first time we’d seen actual copies of our books — not much can top that experience. We signed copies for one another, distributed some to dealers to sell, and were on a panel the next day to talk about them. A terrific experience. http://www.annewhitemysteries.com My first Lake George Mystery, An Affinity For Murder, is the one I’m talking about here. Anne, I’m not familiar with your work — but I will be browsing Amazon for it now. I love your background. I taught for ten years myself, my mother was a school librarian and then my wife and I ran a book store in a small town for a few years. I can only hope to have as successful a writing career as you have. Thanks for sharing. Thanks for writing. I’d love to know inside details on running a bookstore, if you’d be willing to share. My character tries holding book talks with area authors as a way of creating buzz and drawing people to the store. Did you do this? I’d love to know which efforts you made in promoting the store worked and which flopped. Also — I hope your mother enjoyed being a school librarian as much as I did. Very good interview. Good quesitons, informative answers. I enjoy reading about how other authors think and write. So glad you wrote. You said “other authors” so I’ll google you, but maybe you’ll tell me what you write and what you’ve found the best ways to promote. Right now, I think the biggest problem is figuring how to use my time most effectively.Thanks for the post. “Chuffed?” What a great expresssion. I’d love to know exactly what it means. My first thought was overstimulated but — wait — I’ll hit the thesaurus. A perfectly wonderful interview, so informative. These kind of interviews help a reader so much because when you see a book by that author, the author is a real person, not just a name on a book cover. It instantly causes me to investigate the book further. I’m not sure that you’ll see an actual book in a book store except here in upstate New York where I live — I’m working on that aspect of sales — but the covers are pictured on my website http://www.annewhitemysteries.com and on Amazon where all titles are available for purchase. Monti Sykes did the cover for Affinity and I thought she did a terrific job. I’ve didn’t know her at the time, but now we correspond a little. She also writes mysteries. Thanks for writing. Wonderful interview by a wonderful interviewer. What more can anyone say? Best of luck with your books Anne. Ah, thank you Jack. Pleasure to see you here again. Thanks for the good wishes, Jack. Morgen is a terrific interviewer. I couldn’t agree more. Thanks, Anne, for the kind words But Anne Albert stands out because of the 2 A’s and you have that extra syllable besides. Set in a book store? That’s great. It sounds like so much fun. Yes, I love hanging around bookstores and libraries especially now when I no longer work in my former high school library. Now I’ve got to learn what it’s like to own a bookstore, the way my new character does. I bet there’ll be pluses and minuses I haven’t thought of yet. Hi Anne, Congratulations on your OTP win and publication! I’m a new OTP author myself and it’s a great publisher to work with. Best of luck with your many novels to come! So pleased to meet another Oak Tree Press author. Let’s keep in touch. I’ll be looking for information about you, but would love to hear back at whiteink.com about your writing and plans for the future. Love your title. Best of luck. Morgen, I’ll look forward to it. And Catherine Stovall’s title — When Bad Titles Happen to Good Books — terrific title. Can’t wait to read it. It was so nice to read such a comprehensive and deservedly complimentary interview of Anne White, whose Lake George Mysteries weave fascinating tales set in one of the world’s most beautiful regions. I’m biased, of course — about both the region and the writer, who generously shares ideas and advice with others of us who are struggling with the craft of novel writing. Thanks, Morgen for sharing this with all of us. I was so pleased to see Persis’s name pop up on this list. She’s not only mastered the craft of novel writing herself, she’s quick to give other authors a plug and a forum. Whether in upstate New York’s Adirondack Mountains (summer) or Florida (winter), Perky’s always busy, but never too busy to help someone out with whatever she needs. And I love her name! Definitely, Morgen. I’d love to hear more about what she’s up to. She’ll be a great subject..
You both are so kind. ‘Scuse me while I run rewrite my bio to make myself sound worthy of your nice remarks.